Welcome to my blog! I look forward to sharing life’s experiences, recipes, thoughts/opinions, and prayers. I love food and I love to cook, bake, and create lots of neat things in the kitchen. In the past 9 months I’ve converted to eating vegan and have been converting a lot of recipes from my time in France to becoming vegan friendly. I’ve also been creating a lot vegan dishes in the kitchen and look forward to sharing them (even if you aren’t vegan!). My faith is important to me and I love to share it with people. God’s been too good to me and has introduced me to SO many beautiful people from different paths of life. I enjoy participating in interfaith conversation and learning about others. Today was the re-enactment of the storming of the Bastille in front of the Eastern State Penitentiary. 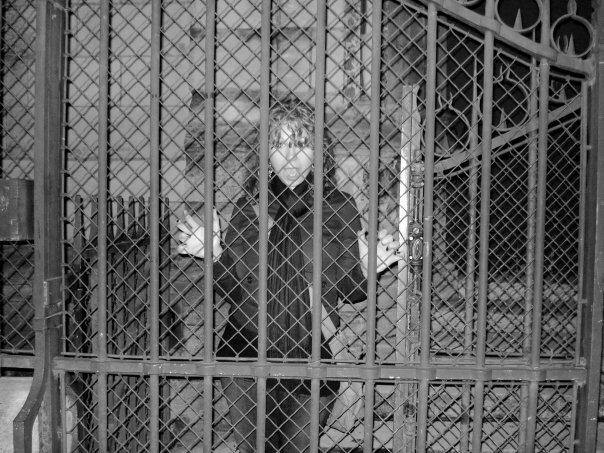 In honor of Bastille Day, here’s a photo of me trapped behind a gate in the building where the kept Marie Antoinette before she went to the guillotine. Exciting. Anxious to read more! I’m anxious to write more and a little nervous! !